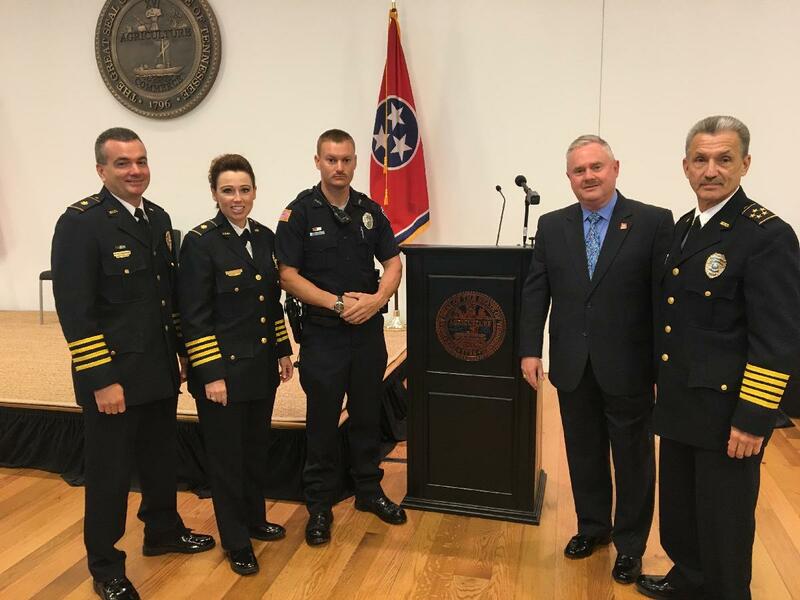 On September 11, 2017, Tennessee Department of Safety and Homeland Security held the Three Stars of Tennessee Award and First Responder Ceremony at the Tennessee Residence. Among those present, were members of the Morristown Police Department (MPD). Morristown Police Department Officer Nathan Cruey received the First Responder Recognition Certificate after he and Hamblen County Sherriff’s Deputy, Bradley Gilmer, were nominated by MPD Major Chris Wisecarver. They were nominated for their heroic act on April 3, 2017. Officer Cruey and Deputy Gilmer responded to a traffic crash involving injuries and vehicle fire on East Andrew Johnson Highway. They broke out the driver’s side window and dragged the unconscious male to safety. According to Major Wisecarver’s nomination, “During the rescue there were small explosions, intense flames including inside the passenger compartment and heavy smoke.” The victim did suffer severe burns to his body and airways; he was treated at the scene by EMS and was ultimately taken to Vanderbilt Burn Center. He has since been released from the hospital and is recovering. Officer Cruey was accompanied to the ceremony by MPD Chief Roger D. Overholt, Major Michelle Jones and Major Chris Wisecarver. Earlier this year, Officer Cruey and Deputy Gilmer received the Medal of Valor from their respective agencies and the Lifesaver Certificate from the City of Morristown Mayor and City Council for the heroic act.